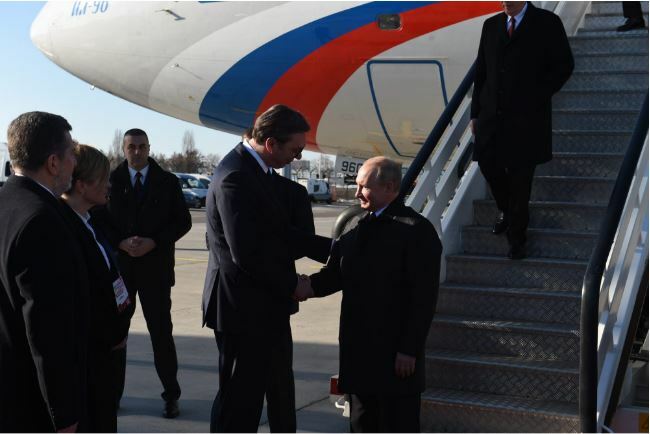 Amid a lavish welcome, Vladimir Putin arrived in Serbia on Thursday in a show of the Russian president’s support for the Balkan country’s populist leader and his pro-Moscow policies, AP reported. Putin landed at Belgrade airport after his presidential plane was escorted over Serbian airspace by MiG-29 fighter jets he recently donated to Serbia. Church bells tolled, guns saluted and supporters waved Russian and Serbian flags on his route through the Serbian capital. Putin and his host, Serbian President Aleksandar Vucic, praised the relationship between the two countries in brief televised statements. Vucic thanked Russia for its support for Serbia’s integrity and added that, “however small,” Serbia has been a “reliable partner” for Russia. Putin thanked Serbia for the warm welcome and praised Vucic for his personal contribution to “brotherly” ties between the two states. Serbia has maintained close links with traditional Slavic ally Russia despite formally seeking European Union membership. Belgrade has refused to join Western sanctions against Russia over Ukraine and has pledged to stay out of NATO. The relations were further boosted recently after Putin stepped up efforts to restore Moscow’s influence in the former communist countries of Eastern Europe. Putin’s visit comes as thousands have held weekly demonstrations against Vucic because of what they see as his autocratic rule. Thousands of Vucic’s right-wing party supporters have been bused into the capital to gather in front of the St. Sava Orthodox church, which the two presidents plan to visit. Vucic’s critics say the gathering has been staged to suggest that the Serbian leader has many more supporters than opponents, who have been marching the same route since December to demand free elections and media. Ahead of his Belgrade visit, Putin accused the U.S. and the West of pressuring Balkan countries to join NATO. Unlike NATO, Putin formally does not oppose Serbia’s EU path and analysts believe that this is because he wants a staunch ally — or perhaps a Trojan horse — within the 28-nation bloc. Putin’s popularity in Serbia is mostly because the Kremlin is supporting Serbia in its rejection of independence for the former Serbian province of Kosovo. In contrast, most Western countries have recognized Kosovo’s 2008 declaration of independence.